One simple interpretation of a negative undercurrent in my recent posts is that the Tom Knudson article appeared, and I could not resist kicking the Watchdog when it was down. Fair enough. But here is the whole story. The idea of anti-export watchdogs working in cooperation with non-primitive, Geeks of Color seemed, to the people overseas, as doomed from the start. Factory owners in Asia feel they have not even been accepted as making new products, let alone recycling properly. It's too big a shock to America and Europe's Narcissistic ecological self-image. 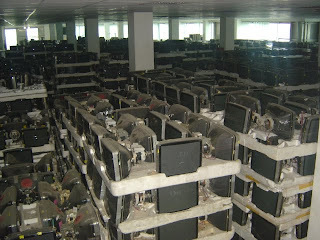 We are unable to recognize e-waste being managed BETTER overseas, and we are unable to recognize that we are chained, by our past "ewaste" marketing, to a story which engineers and geeks everywhere find laughable, racist, and ignorant. * Ten days following the California Compromise meeting in New Orleans, our most open refurbishing factory partner received a letter from their capital. It said that although their import permit was valid, that it was now confined to 4 year old CRTs. I asked Jim at BAN if they were behind this, Jim assured me they were not. But the well was poisoned for the factory which we had R2 inspected and which had ISO14001, etc. I did not openly discuss the timing of the issue, accepting BAN's assurances, and not wanting others to jump to a wrong conclusion. I was closing one eye, still hoping the CA Compromise could hold. * Jim at BAN then emailed that perhaps someone else at BAN was responsible, but that it was a coincidence, and he suggested we move forward. I agreed, but the first candidate for overseas partner announced they were no longer interested in being the importer under the California Compromise agreement. I tried to convince them that I believed Jim Puckett to have been sincere throughout the negotiation, but I too was disturbed by the timing. * The second, next-most logical partner with capacity to recycle CRT glass, ISO14001, and an import permit was a very large facility in Semarang, Indonesia. The factory had allowed WR3A a follow up inspection after the February "Clubbed to Death" articles and press releases by BAN. 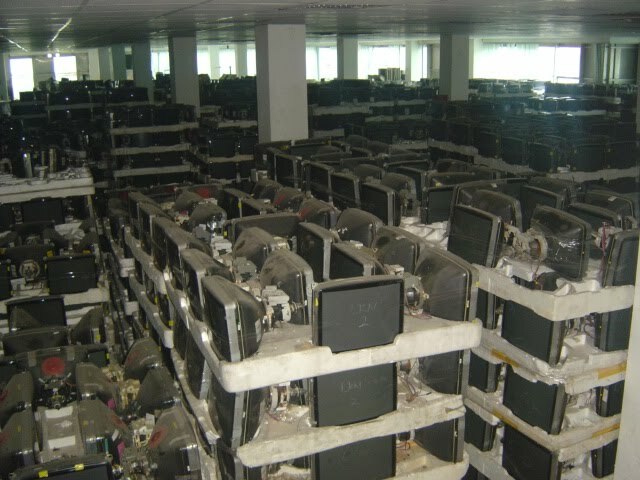 We found that this factory was already accepting BAN-method stripped and tested CRTs for direct rebuilding, as BAN had agreed. We tried to move forward. * The only USA based company which is currently shipping the bare CRTs, according to CA compromise method, was owned by Gordon Chiu. He had a CRT Glass Test passing USA facility, and was shipping the bare tubes. Obviously, since his company had been named in the February Clubbed to Death accusal, this was going to be tough to get past Gordon. It would require BAN to do business with him, or to go into direct competition with him to supply the tubes, either of which would require some admission I didn't expect BAN or NRDC to make readily. * Then, out of the blue, the surprise in Tom Knudson's Sacramento Bee article - that ERI, a major financial donor to BAN - had also been sending to Gordon's company. Here was an opportunity for everyone in the e-waste community to ask itself, did we ever look at Gordon's company? Is it possible he is not an ewaste polluter? "Maybe we should look into this as an opportunity to work with Techs of Color... Even our own Steward was shipping to him..."
Yes, this could have opened a window for BAN and ERI to say that they may have been wrong about Gordon. I sent a message to Jim Puckett alerting him to the fact that Gordon's company was the only one in the USA making shipments to CA Compromise standards (though not exclusively in this method). I did not get an answer. As I said in the past, I have never traded with Gordon, and in many ways am the white competitor to his shipments to SKD factories. * The opportunity was there, for BAN to claim WR3A audited markets, and supply them fully, with CRT testing processes subsidized by CA SB20. * Instead, the story ran as if Asia was Asia, therefore bad. If Bad, then bad for the E-Steward which had shipped there. The articles and response in the American e-waste Recycling community were glee, bemusement, surprise or schadenfreude that ERI was called an exporter. BAN statied that ERI's previous relationship with Gordon's was an unacceptable violation of the Pledge, etc., and the moral of the story remained "don't trade with slant-eyed people, and if you have done so in the past, claim to see the light". I think I'm the only one to ask, what exactly is your problem with Gordon? * Having reached the California Compromise agreement letter, no other organization (SVTC, ETB, NRDC etc) offered to sign. I had asked BAN for help, without any response. The factories overseas asked, "Robin, why do you keep trying to deal with these racist people? 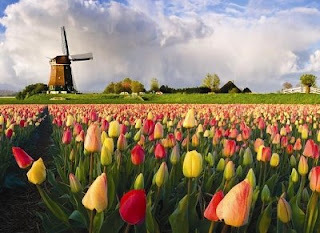 It's so much easier to buy from Asia sources, and properly recycle the fallout from USA exporters currently shipping." You see, the USA and Europe's hedge on the supply of nice "e-waste", i.e. surplus electronics, is shrinking. Hong Kong is now producing more 5 year old equipment than California. Nothing is going to change about the refurbishing market overseas, except for the shrinking percentage of the recycling market held by USA supply. So it looks to me like the state of California looked the gift horse in the mouth, and thinks I'm suffering from losing their computer monitors. Boo hoo. I kept my part of the purchase order. I imagine this is the end of the California Compromise. I feel I have been forced to choose between potential partners. It seems to me that the Americans in this story are jerks (myself, arguably, included). The USA exporters who did not remove junk from Gordon's loads were on all sides of the exporter/Pledge spectrum. The people who could have sent good loads, even the exaggerated pristine BAN-Annex IX-stripped interpretation, were afraid of the image of an Asian factory owner with ISO14001 recycling credentials. Others were ready to cast basically good companies, like ERI, as the evil exporter in the Bee article, though ERI was also involved in discussions with Helen Su of Proview when we were negotiating the Samsung CRT glass washing equipment placed in Klang, Malaysia. I feel that ERI could have come out and participated, and is still potentially a "best available" supplier, if a bit of a hypocrite. ERI and BAN have had a chance to take over the legitimate export market. Instead, they kicked sand in the face. I give up. Meanwhile our best end market just signed up their PO with a Korean recycling supplier. Some may remember that Korean investors now are the largest shareholder in ERI. Maybe there's a great conspiracy theory out there, that the Koreans are purposefully steering ERI away from Gordon so that they can make the money in Indonesia and Malaysia. The only hero in this story is the export market, which is steadily improving, and is already miles away from the Guiyu story rehashed by 60 Minutes. Many if not all Asian buyers responded to the junk in the CRT loads by putting CRT glass washing capacity to handle lower USA quality. This investment was put into the Indonesia plant, and the exporter in the Bee story actually invested in a USA tube stripping operation. If BAN, NRDC, SVTC, etc. are so attached to the "primitive" story, the sun will set on the USA's ability to participate in the best environmental CRT market in the world. The Asian factories are increasingly able to meet their demand with their own generated CRTs, as Asia goes to flat screens. Will the American and European environmentalists go down in history as the Environmental Narcissus? Are we so in love with the story of proper environmental shredding of working product? In face of world display-device demand, the rest of the world is moving on without us, finally able to supply the CRTs they need from other countries. Korea is supplying the used CRT monitors to our partner in Egypt now. Why should I fight to replace Korea + VT with Korea + CA? My invitation to Kate Sindig of NRDC to visit the facilities in Asia went unanswered, and after the latest round of press, I don't know if it is still available. I've still never met Gordon face to face, still only traded with the same factories he traded to. BAN can blame me for not being able to convince them because I've been critical of them. Guilty as charged. At least I can admit it. I was giving up potentially hundreds of thousands of dollars of my end market to California, which would have outpriced me in both transportation cost and quality. But California acted like the Compromise was a favor to Robin. "He seems to really want this..."
Robin - I just recently found your blog and love it. Glad to know that someone out there is standing up for responsible export based recycling. BAN continues to use scare tactics as a means of growing their certification. Their intentions are good but their actions are misled. I compare them to a PETA with their fear mongering.